Below you can track the CVL history and evolution throughout our workshops, from the most recent one in 2016, to the first ones in the early 1990’s. The organizing committee is now in the last stretch to CVL10-New Zealand! See home page for most recent updates. After the tragic limnic gas burst at Lake Nyos on 21 August 1986 volcanic lake research boosted worldwide. Since then, 30 years have past. To commemorate this event, the IAVCEI-CVL converged in Cameroon’s capital Yaounde for its 3-yearly Workshop. Considering the historical role of Lake Nyos, bringing IAVCEI-CVL back to Cameroon 30-years-after is a major accomplishment, and a hinge moment for the commission. The workshop was inaugurated by the Minister of Scientific Research and Innovation, Dr. Madeleine Tchuinte. Many local students besides 65 participants from 11 countries attended the workshop, which was organized by Greg Tanyileke and colleagues (Wilson Fantong, Aka Festus and others) from the Institute of Geological and Mining Research (IRGM, Cameroon), and supported by the International Union of Geodesy and Geophysics. 32 talks were presented during the first three days of the workshop (14-16 March 2016, Hotel Mont Fébé). The Italian team was the largest foreign group. Key review lectures by Nyos-pioneers Minoru Kusakabe (Japan), George Kling (USA), and J-C Sabroux (on behalf of Michel Halbwachs’ team, France) brought heavy-weight to the meeting. The scientific event showed that the initial controversy on Lake Nyos has been replaced by harmony and agreement. After fifteen years of risk mitigation actions by artificial degassing of Lake Nyos, the lake is considered relatively safe. The decades-long dedication and project management, supported mainly by Japan International Cooperation Agency, is a laudable example of international collaboration and capacity building, unique and exemplary. Several Cameroonian experts have now returned home after their PhD in Japan, to self-sufficiently follow up research on their lakes. Participants of the CVL9 workshop, Cameroon 2016. picture by A. Folch. Lake Nyos was visited on 19 March 2016 for a multi-disciplinary sampling and measurement campaign. On 22 March an in-depth survey of Lake Barombi Mbo, largest maar lake in Cameroon, was undertaken. Lake Nyos, early mourning 19 March 2016. picture by D. Rouwet. Logistics meeting at the Lake Nyos lodge. picture by D. Rouwet. Field work at Lake Nyos, 19 March 2016. picture by D. Rouwet. How it’s like being together all day on a raft in the middle of a huge lake, Barombi Mbo field work, Cameroon. video by D. Rouwet. Transport at Barombi Mbo, Cameroon. picture by D. Rouwet. Barombi Mbo, the largest maar lake in Cameroon. picture by D. Rouwet. Rafts need anchors, Barombi Mbo, Cameroon. picture by D. Rouwet. The meeting confirmed the IAVCEI-CVL as a compact, united, and active group of passionate researchers, assuring creative and socially responsible research for this niche topic in the future. The CVL Steering Committee awarded Minoru Kusakabe for his role as the “CVL founding father” and career-long dedication to Lake Nyos and, especially, for his efforts towards capacity building of Cameroonian researchers. In his name and example, the CVL will award the “Kusakabe Award” every three years. Dmitri Rouwet, Greg Tanyileke and Antonio Costa published the detailed EOS CVL9 Meeting report. For the second time in CVL history our workshop was linked to the IAVCEI Scientific Assembly held in Kagoshima, Japan, in July 2013. The theme of the workshop was called: Properties and behavior of volcanic lake as a constituent in teh magma-hydrothermal system. CVL8 was organized by T. Ohba, B. Chako Tchamabé and their co-workers. 50 researchers from 16 countries attended CVL8. The Japanese hosts and the Cameroonians were the most represented delegations. CVL8 was finncially supported by IAVCEI and teh Earthquake Research Institute of the University of Tokyo. 43 studies were presented during 9 sessions with varying topics such as (1) hazard mitigation involving crater lakes, (2) geophysical studies of crater lakes, (3) geochemical studies of crater lakes, (4) volcanology of crater lakes, (5) biological studies of crater lakes, (6) limnology, (7) hydrology of crater lakes, (8) modeling, simulations and innovative studies on crater lakes, and (9) physical studies of crater lakes. Illumination and enlightenment during a talk by B. Christenson, Kumamoto. picture by R. Mora-Amador. Participants of the CVL8 workshop at Kumamoto University, Japan 2013. picture by M. Kusakabe. Prior to the scientific sessions at Kumamoto University, the Kirishima volcanic area, known for its 26 January 2011 crater lake breaching eruption, was visited. Two days later the group took a glimpse of the almost vanished famous Yudamari crater lake of the highly active Aso volcano. “Dino-rafting” in the Kirishima volcanic area, Japan. picture by D. Rouwet. 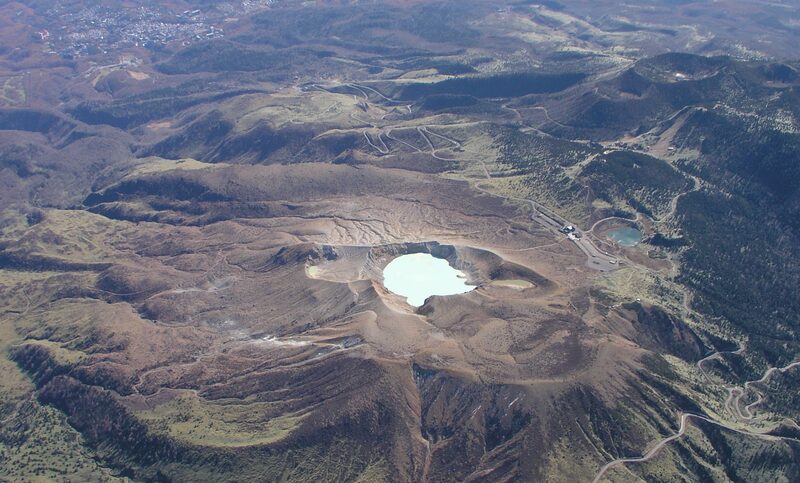 A famous crater lake just before its dry-out, Yudamari, Aso volcano, Kyushu, Japan. picture by D. Rouwet. At the Aso summit observation point. C. Ramírez, Aso gas specialist and former CCVG Leader H. Shinohara, G. González. D. Rouwet in front of an Aso banner: how it would have looked like. picture by R. Mora-Amador. Flying from the heat of Kyushu’s Fukuoka to the cooler temperatures of Hokkaido, field work continued in the area squeezed between Lake Toya and Usu, the volcano affected by the surreal bradyseismic and erupive activity in 2000, where volcanic lakes cover the volcano flank. In the evenings the participants tasted from the Japanese Onzen culture and marvellous food, after visiting the Noboribetsu geothermal area, at the outskirts of Lake Kuttara, for pH1 water sampling of the lakes and springs. Noboribetsu geothermal area, Hokkaido, Japan. picture by J. Cabassi. Lake Toya, Hokkaido, Japan. picture by D. Rouwet. Crater lake at Usu flank with Lake Toya in the background, Hokkaido, Japan. picture by D. Rouwet. Participants of the Hokkaido field trip of the CVL8 workshop (Usu Volcano Observatory), Japan 2013. After the CVL8 workshop Takeshi Ohba, Corentin Caudron and Bruno Capaccioni took the initiative to edit a Special Volume in the Geological Society of London series entitled Geochemistry and Geophysics of Active Volcanic Lakes, including studies presented during the CVL7-Costa Rica and CVL8 workshops. After an unusual break of almost 6 years since CVL6-Argentina (2004), volcanic lake researchers reunited in Costa Rica, in spite of being a small country, the home to three crater lakes topping active volcanoes (Poás’ Laguna Caliente, Irazú and Rincón de la Vieja) and two presumably “Nyos-type” lakes (Laguna Hule and Río Cuarto). The main goal of CVL7 was to get a realistic picture of what lake research stands for anno 2010, by attracting the most representative group of participants -lake pioneers as well as new-entries, fluid geochemists as well as biologists and limnologists. 51 participants from 14 countries attended CVL8 that was organized by the locals R. Mora-Amador and C. Ramírez (Universidad de Costa Rica, UCR) and M. Martínez-Cruz (OVSICORI). 27 seminars were presented during the first two days at UCR, followed by a poster session during a visit at OVSICORI. During the traditional field work at CVL workshops, sampling at Poás’ Laguna Caliente was omitted for safety reasons, after the Christmas 2009 surprise phreatic eruption that converted Poás in the most active crater lake for the years to come. Instead, Laguna Botos, the clear water lake near the summit of the volcano was probed. Rafting at Laguna Botos, Poás (Costa Rica). picture by D. Rouwet. The main sampling and measurement campaign (CO2 flux, probing and sampling at depth) was held at the poorly studied Laguna Hule and Río Cuarto “Nyos-type” maar lakes, known to overturn once in a while. Results of this group effort, representative of the team spirit during CVL7, is published by J. Cabassi et al., introducing “bio-activity lakes”. Laguna Hule, Costa Rica. Note the raft in the middle of the lake for scale. picture by R. Mora-Amador. Sampling and probing at depth from rafts (up), and CO2 fluxing (lower) from the Laguna Hule lake surface. picture by R. Mora-Amador. Río Cuarto’s turned over just before CVL7. picture by R. Mora-Amador. Participants of the CVL7 workshop gathered at Laguna Hula, Costa Rica, 2010. CVL7 kickstarted the activities of the “new” CVL Steering Committee, a mix between experience and youngsters, exactly what CVL7 mirrored. During CVL7 Dmitri Rouwet proposed to publish the first monograph on Volcanic Lakes that was eventually published by Springer in March 2015. Dmitri Rouwet and Takeshi Ohba published the EOS CVL7 Meeting report. The CVL6 workshop was organized by Joop Varekamp, Alain Bernard, Adriana Bermúdez and Daniel Delpino in Caviahue, Argentina, after the IAVCEI Scientific Assembly in Pucón, Chile, in November 2004. 27 participants originating from 11 countries attended CVL6. To reach the shores of Lake Caviahue, at the foot of the crater lake bearing Copahue volcano, a mini-van transported the participants from Pucón across the border to Caviahue. Lake Caviahue is an acidic (pH 2-3) Patagonian lake dammed by volcanic deposits, resulting in the particular bifurcated basin: a lake with two long arms. Argentina-Chile border. picture by R. Mora-Amador. Reaching Caviahue. picture by R. Mora-Amador. The first days talk sessions were organized in the lodge of the village. Talks by B. Takano, J.C. Varekamp, M. van Bergen, C. Ramírez, A. Bernard, Y. Taran, and D. Rouwet, followed by talks on the peculiar local setting, are remembered. The atnosphere during the workshop was familiar as always, and CVL6 reflected a good mix between students (the young M. de Moor, A. Goss, D. Rouwet, R. Mora-Amador, C. Ramírez, L. Trunk) and lake pioneers. CVL6 was the last workshop “Boku” Takano participated, before retiring. Patagonian Araucarias, living fossils, on Copahue’s flank. picture by R. Mora-Amador. Lake Caviahue within the Caviahue depression. picture by R. Mora-Amador. Waterfall. picture by R. Mora-Amador. Another waterfall. picture by R. Mora-Amador. R. Mora-Amador, J.C. Varekamp, C. Ramírez and Y. Taran. picture by R. Mora-Amador. Columnar joints in the amazing Caviahue-Copahue area. picture by R. Mora-Amador. The next day a group climbed to the crater lake and near-summit acidic flank springs of Copahue volcano, while a second group sampled the hydrothermal manifestations of Las Máquinas and Las Maquinitas. All these fluids were sampled, from the summit lake, the flank springs to the fumarolic, bubbling and geothermal well gases at the foot of Copahue. Then CCVG Leader Yuri Taran and his late wife Luci sampling bubbling gases from hot springs at Las Máquinas. picture by R. Mora-Amador. Following CVL6 J.C. Varekamp and M. van Bergen edited a Special Volume in JVGR (2008, Vol. 178/2) containing 17 papers. A more recent picture of Copahue crater lake, prior to the December 2012 eruptions. picture by A. Caselli. The largest hyperacidic crater lake on Earth, the enigmatic Kawah Ijen at dawn, Java, Indonesia. picture by D. Rouwet. Crater Lake and Wizard Island, Oregon, USA. picture by D. Rouwet. The International Association of Volcanology and Chemistry of the Earth’s Interior (IAVCEI) welcomed IWGCL as a commission in 1993, rebaptising it the Commission on Volcanic Lakes (CVL). The CVL3 workshop was organized by S.M. Fazlullin in Vladivostok (Russia) in 1995 as part of the 8th International Symposium on Water-Rock Interaction of IAGC. The meeting was attended by ca. 40 people under the section “Physical-chemical processes in crater lakes”. Eleven papers presented at this section were published in the Proceedings of WRI-8 (1995). The geochemistry and bio-geochemistry of acid crater lakes and impact of active crater lakes on the environment were discussed. At that time, the latter subject was a new entry for the CVL community. The scope of IWGCL was expanded in its 2nd meeting (organized by M. Kusakabe in 1992 at Misasa, Japan) to include not only studies of gassy lakes in Cameroon, but also those of other volcanic lakes in general. The objectives were to obtain information on activity and degassing state of shallow magmatic bodies so that forecasting volcanic eruptions and mitigation of volcanic lake-related hazards can be achieved. Three meeting reports were published: a detailed one by K. Tietze in our Newsletter (“International Working Group on Crater Lakes Newsletter”, No. 6, p. 5-18, 1993), a short one by M. Kusakabe & K. Tietze in the Newsletter of the World Organisation of Volcano Observatories (“WOVO News”, No. 3, p. 3-4, 1993) and a short one by M. Kusakabe in EOS (Vol. 74, p. 325, July 20, 1993). Papers presented at the Misasa meeting were published in a Special Issue of Geochemical Journal “Geochemistry of Crater Lakes”, edited by M. Kusakabe. Misasa Onzen, Japan. Source internet. On 21 August 1986 a lethal CO2 cloud burst from the bottom waters of Lake Nyos in northwestern Cameroon, killed 1746 people and over 3000 livestock. After early discussions on the process behind this gas release (volcanic vs limnic eruption), during the International Conference on the Lake Nyos Gas Disaster in Yaoundé in March 1987, the International Working Group on Crater Lakes (IWGCL) was born. The main body of the current Commission on Volcanic Lakes was created initially as the International Working Group on Crater Lakes (IWGCL) in 1987 when the International Conference on the Lake Nyos Gas Disaster was held in Yaounde, Cameroon. The purposes of IWGCL at that time were to exchange scientific information about the Lake Nyos gas disaster, to adjust the follow-up field works planned by those who were interested in this subject, and to organize scientific meetings as a forum for further studies. When Lake Nyos’ bottom water naturally recharged with CO2 in the years post-1986, it became clear that the limnic eruption hypothesis with consequent CO2 release was the most likely.